A sumo wrestler's success depends on his weight. The larger the wrestler, the better chance he has in the competition. A sumo wrestler's diet, therefore, is aimed entirely at helping wrestlers to gain weight as quickly and efficiently as possible. Besides food intake, the timing of meals and exercise also play an important role in weight gain. In sumo wrestling, the objective is to knock one's opponent to the ground or out of the ring -- all without punching, kicking or pushing. Throws and headbutts are the primary method for conquering an opponent, and for sumo wrestlers to avoid being knocked off-balance themselves, it is helpful to have a strong center of gravity. To accomplish this, sumo wrestlers, also known as rikishi, deliberately gain weight in order to have a large upper body. Exercise increases lower body strength, which can make rikishi hard to topple. The staple food of a sumo wrestler's diet is chankonabe, a rich stew that is served at each meal. Eating chankonabe is a requirement for rikishi, as it is a revered tradition that dates back to the early 19th century and can be a key component in helping rakishi reach their caloric goal of 10,000 calories a day. The 630-lb. 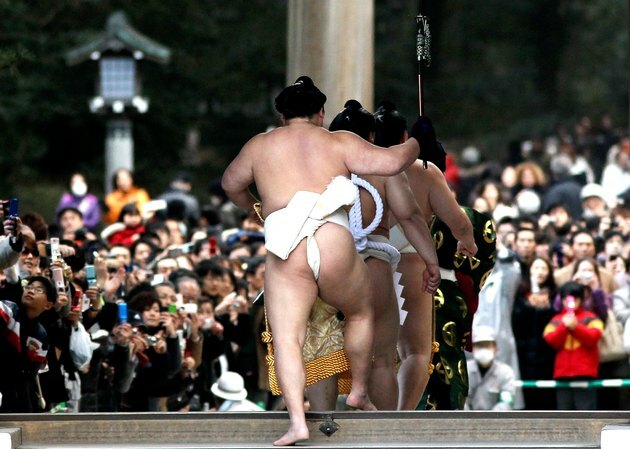 sumo wrestler Takamisugi is known for eating 65 bowls of the stew at one sitting. The stew consists of a melange of ingredients that include chicken, beef or fish along with cabbage, radish, eggplant, mushrooms, tofu and udon noodles. Other foods that a sumo wrestler eats may vary. Rikishi may consume beer, rice, sushi, fried chicken and other foods along with the chankonabe. Years ago, Japanese researchers discovered that sumo wrestlers were at a higher risk for diabetes and hypertension than the Japanese general population. This risk continues today, making sumo wrestling one sport that could be considered unhealthy. A popular misconception is that sumo wrestlers sit around and eat all day. In actuality, rikishi eat two meals a day, the main meal, which takes place at noon, and an evening meal. These meals are formal, with the rikishi being served according to rank. Wrestlers spend the morning doing chores and engage in practice sessions that can be hours long. After the noon meal, during which the rikishi eat the aforementioned chankonabe along with other high-calorie foods, they lie down to take a long nap, as it is believed that the body is more likely to store fat under these conditions. The evening meal is not as large, but wrestlers nevertheless consume many additional calories to support their weight gain. What Do Sumo Wrestlers Wear During a Match?